A common concern among prospective vegetable gardeners, is that they don’t think they have enough space to make growing food worthwhile. 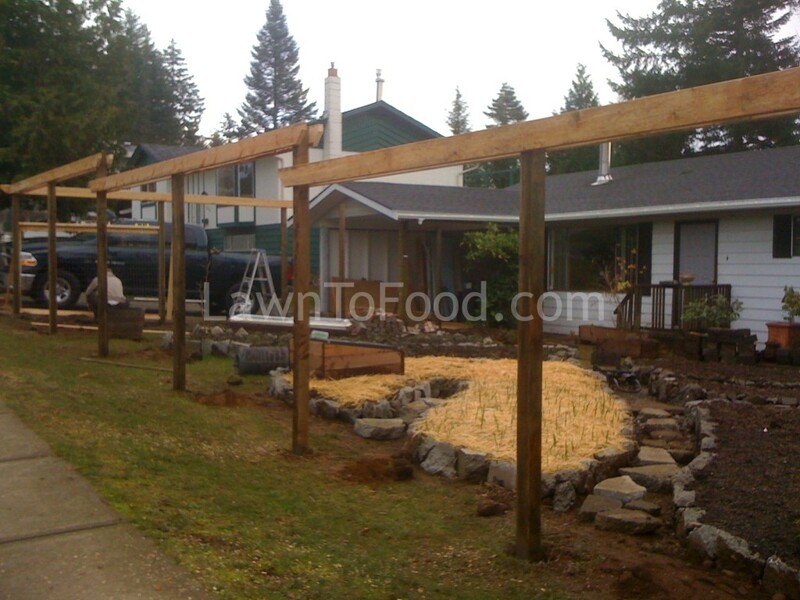 How could a small space produce an ample amount, since farmers use acres of land? Others are concerned that vegetable gardening is too much work and that they’d never find the time. I just shake my head at this thought. First of all, I’ve never consider gardening “work”. In my opinion, it is an absolute pleasure to help nature grow such a beautiful bounty. Or use that time at home after work, put on comfy clothes, walk out into the peaceful garden with a basket, stroll through plucking any vegetables and herbs that are ripe, tug a few weeds on out, tie up the towering tomatoes, don’t use your bank card, make a gorgeous salad, steam up some greens, mash some root veggies or perhaps, a little of each? Later that evening, if it’s been hot, turn on the watering system and then turn it off before bed. Some garden bounty that I transformed into a vegetable lasagna. Today’s harvest that will be used for tomorrow’s Family Sunday Brunch. Sure it takes initial effort to create a vegetable garden. Raise beds may have to be built, soil and admendments may have to be brought to the site, and watering systems set up. Get excited about the process because being able to produce your own food, is well worth the effort. Once the seeds are planted, with a little love, they will grow all by themselves. For convenience, keep the garden close to the kitchen. Only grow what you like to eat and a maybe few experimental plants. 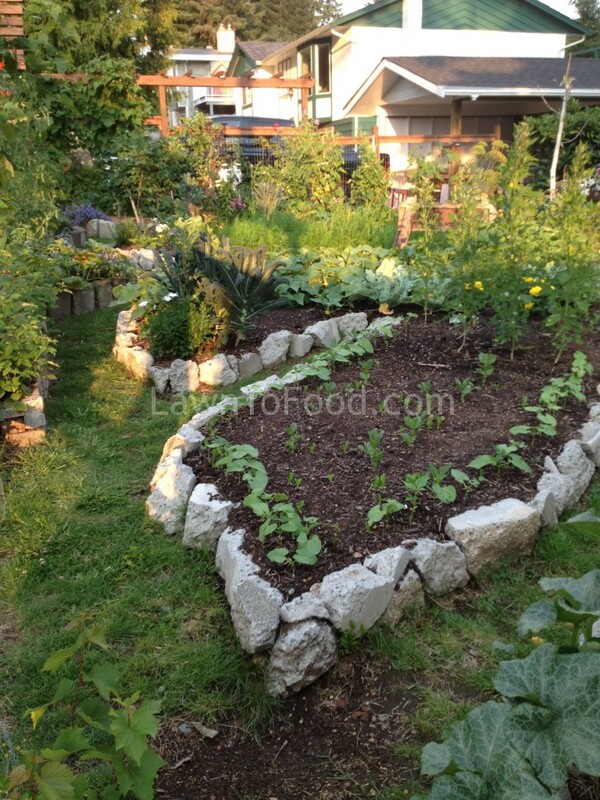 Some small vegetable beds can continue to produce food all year long with a little planning. 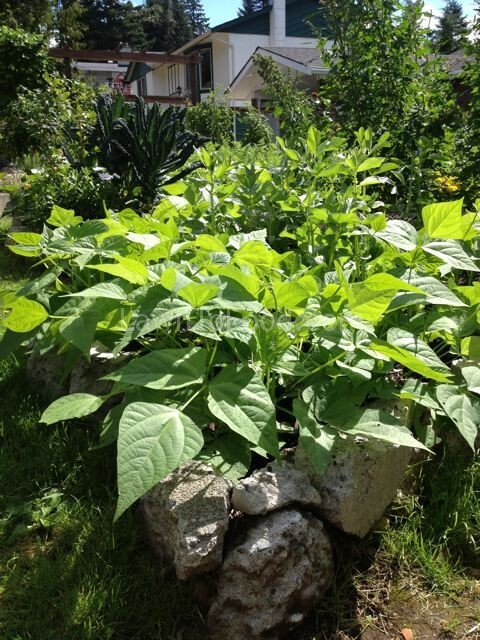 This is one example of how a small plot will continue to produce food for a whole year. Last October, I planted garlic in this new vegetable bed. Throughout the winter and early spring, the garlic cloves grew into bulbs. 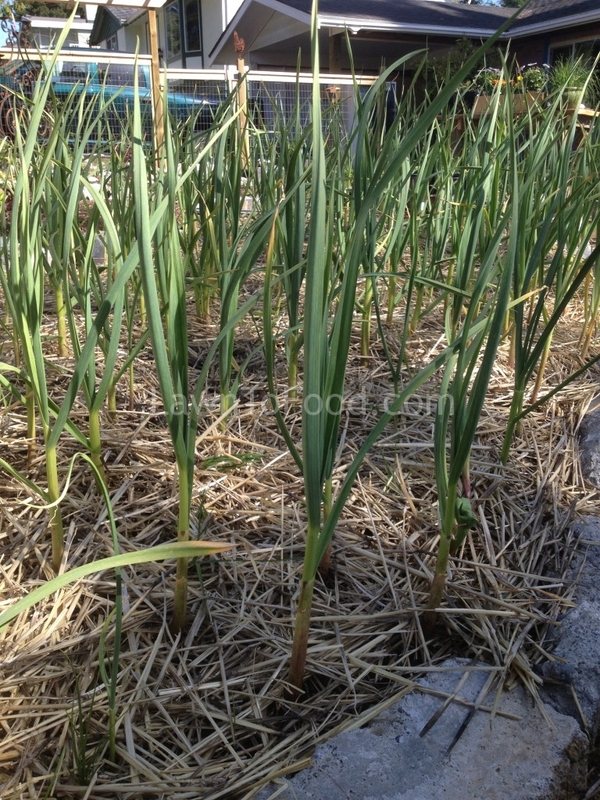 Garlic sprouts peeking through the straw mulch in December 2012. 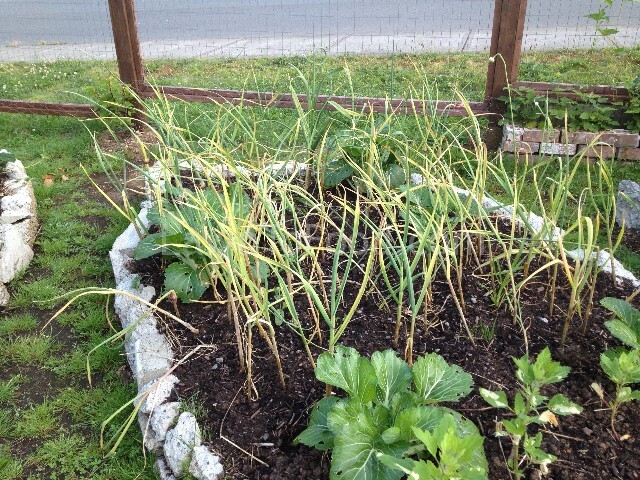 Above is a picture of the garlic patch in May. This is when I planted bok choy seedlings in amongst the garlic. 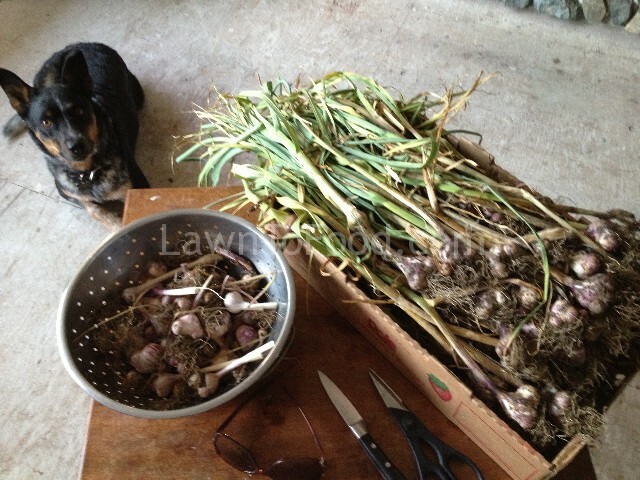 To make some room for the bok choy seedlings, I harvested a few garlic bulbs that were mature. This is a picture of the patch in mid June. The bok choy is thriving. The rest of the garlic is yellowing, drying which means it is ready to harvest. I harvested over 200 bulbs of garlic that I will preserve by hanging some to dry in the pantry and dehydrate the rest for garlic powder. This will last the 2 of us at least a year. 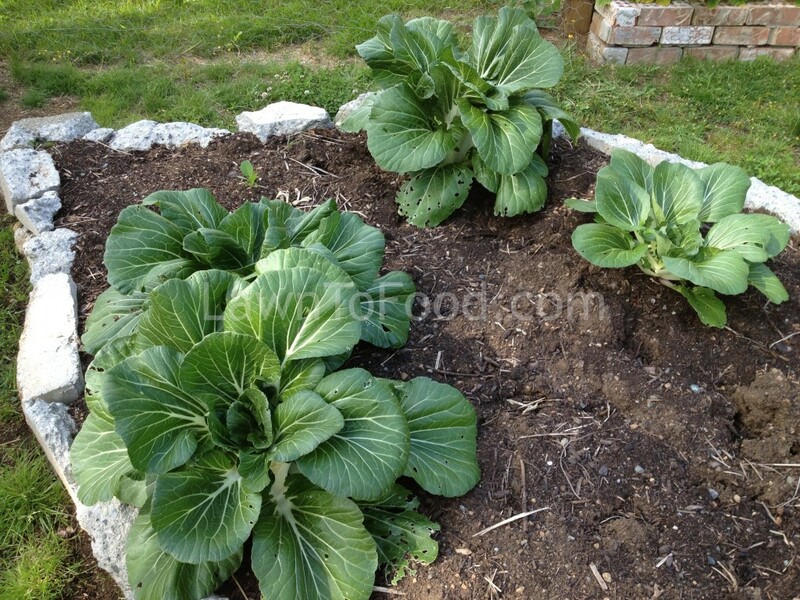 By the first week of July, the bok choy was huge and ready to harvest. I think there were about 10 heads in total, but not all of them are in the photo. I used 1 to create a fresh slaw-type Asian salad and another for a Sweet & Spicy Asian inspired soup. 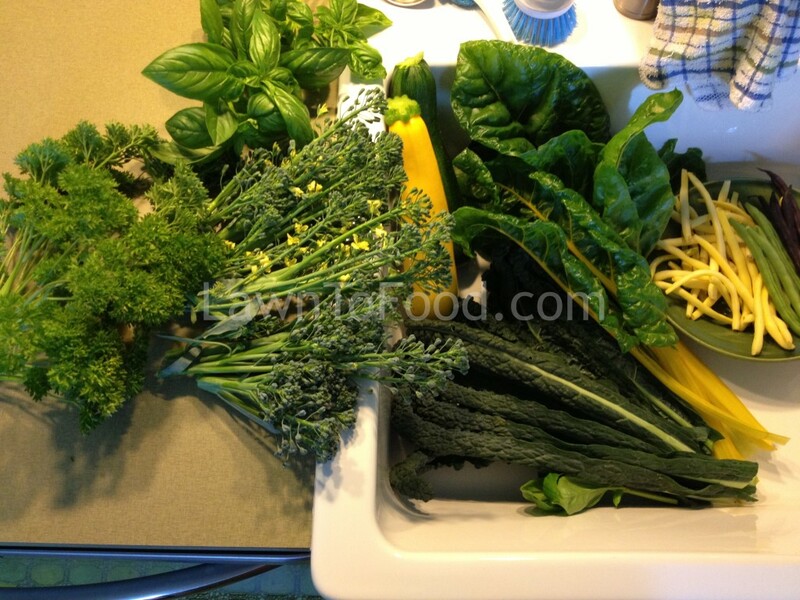 The rest are pictured below, ready for a rinse, in my vegetable washing sink. 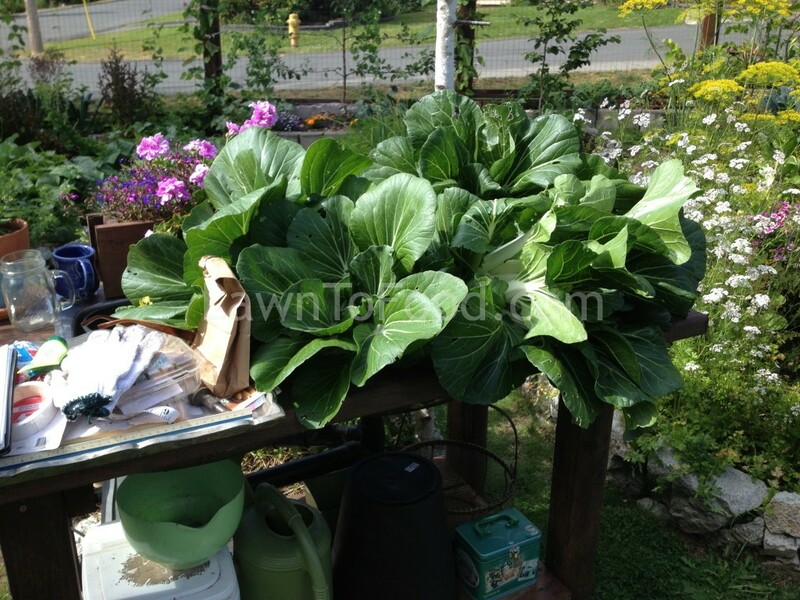 Now, my challenge was how to preserve my bok choy harvest? 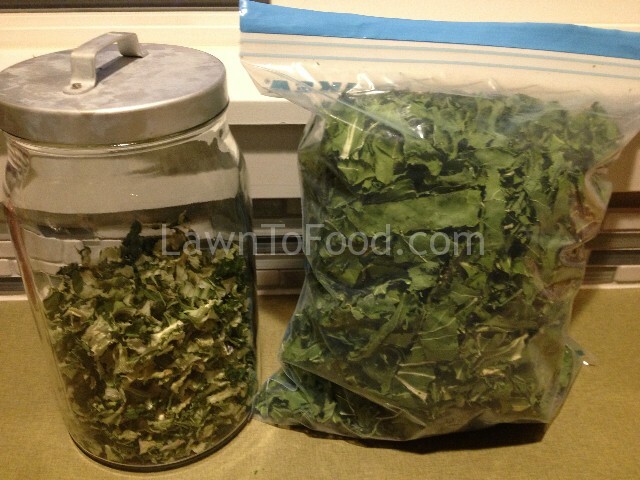 Last year, I blanched and froze several small baggies of the greens to use in winter soups and stir frys. I’ve learned more about the benefits of eating raw enzyme-rich foods in our daily diets, so this year I chose to dehydrate the bok choy. Keeping the dehydrator at a lower temperature, ensured that the health benefits wouldn’t be destroy by heat, as the moisture was removed. I chopped and separated the thick, white stocks from the leafy green parts, putting them on separate sheets for drying. That mountain of bok choy was reduced to these 2 small containers !! Look how much space dehydrating saves. The bok choy smells and tastes amazing in its current state, so it’s become one of my husbands new snack foods. Who knew? If there is any left, I will re-hydrate it for winter soups and stews. After harvesting both the garlic and the bok choy, the empty gardening space was planted again on July 10. I put bush beans around the edge, fava beans in the center (because they will grow tall) and a few scattered romaine lettuce seeds. The bean crop will help re-nourish the soil with nitrogen as well as produce us more food to eat. This is how it looks today, August 17, after a month of growing. I am truly looking forward to harvesting beans and lettuce throughout September and October. Of course, if you need a helping hand to get your vegetable garden on track, be sure to give me a call if you live in the Comox Valley. I’d be more than happy to support your efforts. 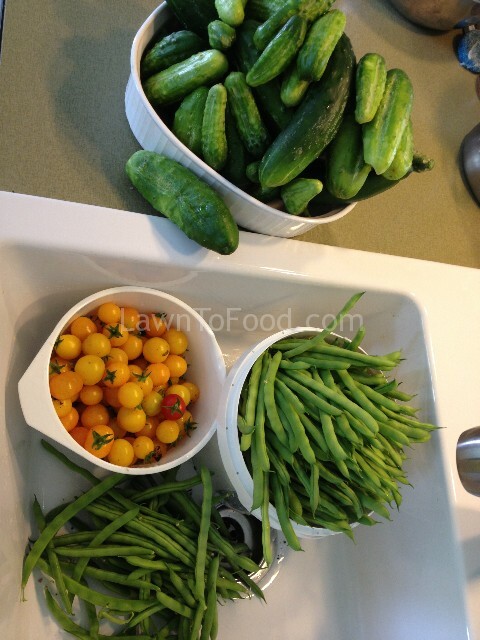 This entry was posted in Containers & Small Spaces, Crop Planning, Growing Food, Reep the Harvest, Season Extenders and tagged grow, succession planting by Lynda. Bookmark the permalink. I’m new to gardening but I’d like to plant garlic….is that something that is planted in the fall? (In Comox). If so, were would some one get organic garlic seeds? Welcome to gardening! This is the perfect time of year to plant garlic for harvesting next spring. I am going to make a blog post about the subject tomorrow afternoon. It will include information about soil, site, where to find organic varieties and how to plant garlic cloves so that they will grow into bulbs.